Number of financings heightened to 30, a seven-week high. No brokered financings were announced this week, a one-week low. Total dollars increased to C$31.9m, a three-week high. Average offer size decreased to C$1.1m, a two-week low. International Lithium (TSX-V:ILC) announced a non-brokered private placement of up to 15.4 million flow-through shares @ C$0.065 for gross proceeds of up to $1.0 million. The proceeds will be used for exploration on the Raleigh Lake rare metals project in Ontario, Canada. The company also announced that the final closing of a non-brokered private placement of up to 50.0 million units @ $0.05 announced in December 2018 was extended until February 28th. Each unit consists of one share and half a warrant exercisable @ $0.10 per for two years. International Lithium also closed the first tranche of its non-brokered private placement of units for proceeds of $1.2 million and issued 24.0 million shares and 12.0 million warrants. The company also announced a non-brokered private placement of convertible debentures of up to £240,000. The debentures will mature in May 2019 and bear interest at 15%. The debenture-holders may convert at any time @ C$0.07 per share. International Lithium (TSX-V:ILC) opened a C$5 million offering on a best efforts basis. Each unit includes half a warrant that expires in two years. Condor Gold (TSX:COG) opened a C$3.0 million offering on a best efforts Each unit includes half a warrant that expires in two years. Miranda Gold (TSX-V:MAD) opened a C$64 million offering on a best efforts basis. Each unit includes a warrant that expires in five years. 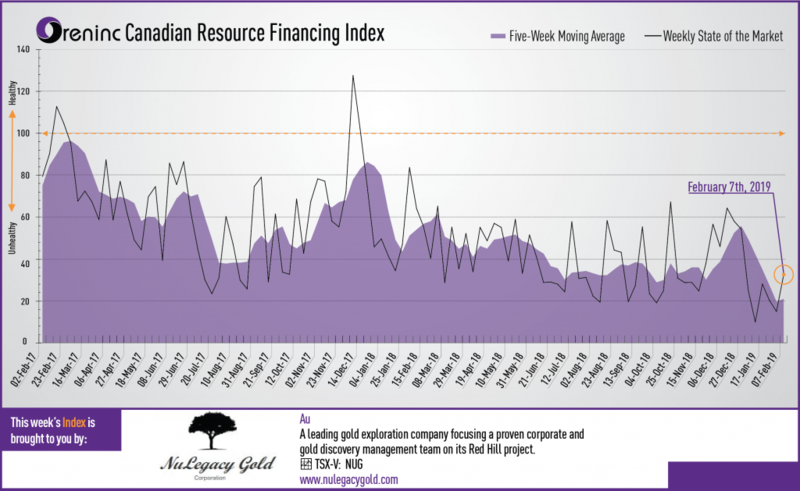 Tudor Gold (TSX-V:TUD) opened a C$5 million offering on a best efforts basis. Each unit includes a warrant that expires in one year. Premier Gold Mines (TSX:PG) closed a C$06 million offering on a strategic deal basis. Each unit included a warrant that expires in three years. Platinum Group Metals (TSX:PTM) closed a C$5 million offering on a best efforts basis. International Lithium (TSX-V:ILC) closed a C$5 million offering on a best efforts basis.